Experience the mesmerising delights of Dubai with a stay at the upscale 5-star Hilton Dubai Al Habtoor City. The hotel is an opulent choice ideal for the business traveller or visiting family. Hilton Dubai Al Habtoor City is located on the Sheikh Zayed Road alongside the Dubai Water Canal and just 18 km from the airport. Its opulent design includes ambitious hospitality with a 30-metre-high theatre for light, sound and water shows amidst an entertainment complex that serves the whole of the Al Habtoor City development. Relax in lavish suites and rooms, enjoy Executive and Family suite privileges; there’s access to spa and fitness plus a fantastic outdoor pool area. From thrilling kids’ club activities and services to the less enthralling but thoughtful amenities such as laundry and dry-cleaning; this is a resort with plenty of Dubai WOW factor. 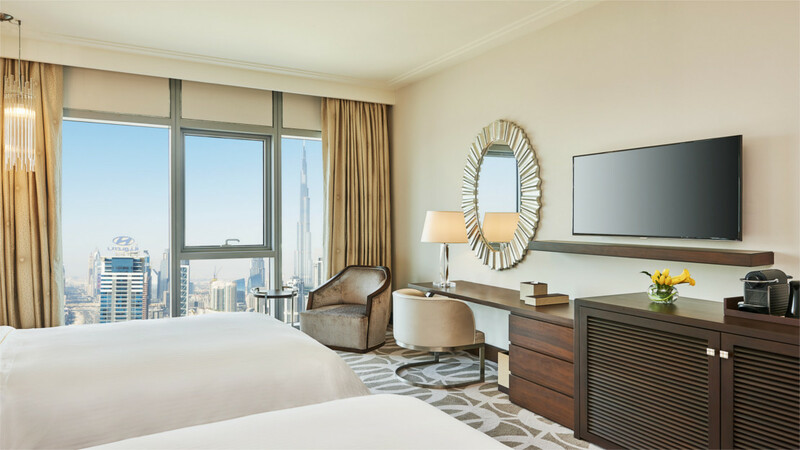 Hilton Dubai Al Habtoor City is located on the Sheikh Zayed Road, with easy access to a host of Dubai's world famous attractions. A complimentary shuttle bus also runs from the hotel to The Dubai Mall. Dubai International Airport is approximately 18km away from the Hilton Dubai Al Habtoor City. The Hilton Dubai Al Habtoor City operates a complimentary shuttle bus to the beach at the Habtoor Grand Resort. Details may be subject to change. You will be provided with full details of the Hilton Dubai Al Habtoor City Executive benefits on arrival at the hotel.